Developed to withstand heavy foot traffic, Flex tapes provide a durable solution for 5S, organization, safety communication and work flow. Flexible enough to be applied to uneven surfaces Flex’s textured surface provides an anti-slip surface for foot traffic safety. 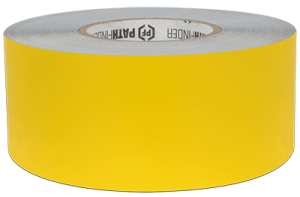 This tape is ideal for color coding, aisle, hazard and boundary and organizational marking. For use with heavy foot traffic and light vehicle traffic. Polycarbonate Textured Surface: the textured surface provides an anti-slip surface. Flexible Construction: this floor tape is suited for uneven surfaces. Heavy Duty: resistant to water and most chemicals. Easy to Install: our easy-to-peel liners and quick curing adhesive make installation a snap. Removes Cleanly: the rubber based adhesive removes easily and cleanly with minimal to no residue.